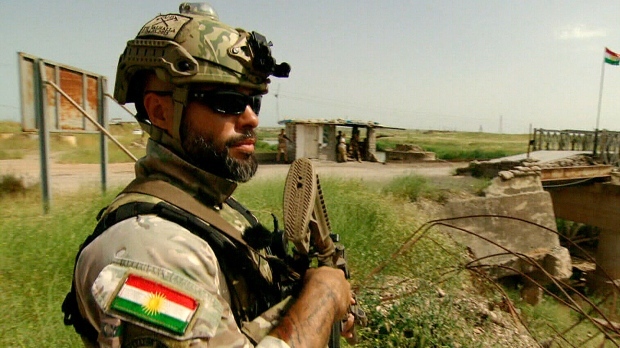 CTV News cameras capture a Canadian soldier wearing a Kurdish flag on his uniform in Iraq. OTTAWA -- Canada's top soldier has decided special forces troops in Iraq will continue to wear the Kurdish flag on their uniforms in addition to the Maple Leaf, despite questions about the practice. National Defence says Gen. Jonathan Vance recently approved the flag patches in part to show solidarity with "a region facing existential threats," but that they should not be construed as support for an independent Iraqi Kurdistan. That may be wishful thinking, say experts, one of whom compared it to a foreign military force wearing the Quebec flag in Canada. The Kurds' distinctive red, white and green flag with a sun emblem has been on the Canadian soldiers' uniforms since they arrived in northern Iraq to help the Kurdish peshmerga fight ISIL in 2014. The practice wasn't publicly known until Vance led a group of Canadian journalists on a tour of the mission in April. At the time, Canada had several dozen special forces operatives in the region, though the Trudeau government is expanding the contingent to 200. The military initially defended the flag patches, which are on one shoulder with the Canadian flag on the other. Officials said they were used for cohesion with Kurdish and allied forces, and to ensure Canadian forces could be easily identified by friends on the battlefield. Nonetheless, a review was ordered after experts warned that sporting the Kurdish flag, rather than the Iraqi flag, could be interpreted by both Iraqis and Kurds as support for an independent Kurdistan. National Defence spokesman Daniel Le Bouthillier said Friday the review was recently completed and Vance had decided to keep the Kurdish flag patches. The flag "acts as an identification patch with our partner force, demonstrates solidarity with a region facing existential threats for which we are there to help, and is in keeping with previous methods used by Canada and allies when working with partner forces," Le Bouthillier said in an email. "The flag is in no way a symbol of Canadian support for political disunity in Iraq," he added. But two experts say whether the military likes it or not, wearing the Kurdish flag is highly symbolic inside Iraq, with its ethnic and religious divides. "It's the optics of it on the larger political dimensions," said Denise Natali, an expert on Kurdish politics at the Institute for National Strategic Studies in Washington. "Every time these types of things are done that support sub-state groups, it is actually undermining the idea that they need cohesion and unity." Bessma Momani, a Middle East expert at the University of Waterloo, put it another way. "Would we be comfortable with other forces putting on a Quebec flag?" she asked. "This sends mixed signals to our political partners." Concerns about Canada unintentionally contributing to Kurdish independence haven't solely related to the flag patches. Officials warned Prime Minister Justin Trudeau last year that the Kurds could use the military training and equipment Canada is providing to fight ISIL to one day push for an independent state. Speaking to the Canadian Press from Washington this week, where Canada and its allies preached the need for unity in Iraq, Defence Minister Harjit Sajjan said the Liberal government is "sensitive" to concerns about Kurdish independence when it comes to Canada's mission in the region. "The peshmerga are part of the Iraqi security forces, and every time I've met with the Kurdish leadership, they have stressed that themselves," he said. "Every time we have sat down, they've actually had their own Kurdish flag at the table and an Iraqi flag as well. So this is something we are very sensitive to."